Panzerkampfwagen VI ausf B (SdKfz 182) of Schwere Panzer Abteilung (Heavy Tank Battalion) 503 is spray painted with the "dunkelgelb" ("dark yellow") camouflage pattern that allowed for much variation prior to the unit's combat in the Normandy Campaign. Note that the outer road wheels have been removed. Panzer Abteilung 503 was the first unit to receive the Tiger II on June 16, 1944. The unit only had a few weeks between leaving the Eastern Front and deploying against British Forces around Caen. General Heinz Guderian (June 17, 1888 - May 14, 1954) the Generalinspektur der Panzertruppen (Inspector-General of the Armoured Troops) was present when the unit received its first Tiger IIs and this photograph was probably made that same day or soon thereafter. His visit was ironic, because he, like many Panzer officers, did not want the Tiger II because they recognized the Tiger I ausf E could defeat all Western Allied and most Soviet armor, and the time to retool for Tiger II production meant that less heavy tanks would reach the front. 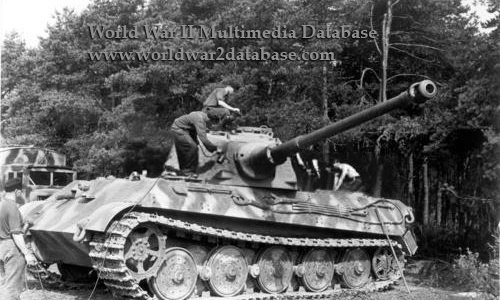 Panzer Abteilung 503 initially only received enough Tiger IIs to equip 1.Kompanie; of the fourteen Tiger IIs originally issued, and twelve replacements, only two survived the Normandy Campaign. 3.Kompanie, when refitted with Tiger IIs in August 1944, was wiped out on their way to the front in a single day by Allied bombing, their Tigers overturned like toys. 489 Tiger IIs were built between December 1943 and May 1945, not enough to stop the Allies.